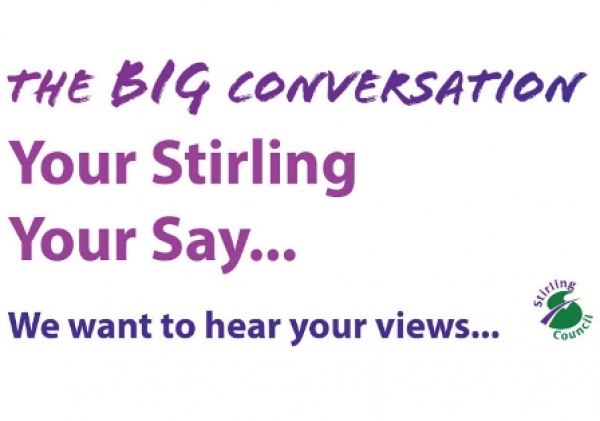 Starting on October 15, a series of Big Conversation events will take place across the Stirling Council area as part of our aim of putting communities at the heart of our budget planning. The Council needs to make £24million of savings over the next five years, which means transforming the way we deliver our services and making some tough decisions. As part of this process we want to have an open and honest discussion about the services that are most important to you. We will be hosting Big Conversations in the community. All are from 7.00pm till 9.00pm and open to everyone. * On Monday 22 October the Big Conversation will be at Wallace High School. * On Tuesday 23 October we will be at Stirling High School. * On Wednesday 24 October we will be at McLaren High School. We are encouraging local people to host their own Big Conversations with family, friends, neighbours, community groups, co-workers. We have prepared Big Conversation “Meeting in a box” materials which you can use for your own conversation. All we ask is that you record the conversation and send it back to Stirling Council. Meeting in a box at https://www.stirling.gov.uk/__documents/final-meeting-in-a-box.pdf We want to hear from YOU – the people who live and work in our communities. Your views and ideas will help transform Stirling. We would appreciate if you could forward this information round your next works. We look forward to hearing from you.